Audience profiles and audience personas. Do you know what to use when and why? Keep reading to find out what each are, why you need both and how they work together to keep you on top of your perfect client. I remember like it was yesterday a conversation between gram and I. Being a rebel I didn't listen to anyone except this wise old woman who I thought had tons of skin in my game of life. She told me to be careful with who you surround yourself because they will either make you thrive or wither and die a slow death. A little dramatic I thought, but I banked this little ditty into my brain for safekeeping. Who would have known that this advice would be a driving force in my entrepreneurial journey? Because knowing who you want to work with, partner with and who you don't is the first step to success in business. Think back to when you were in your prime and your group of friends. They either stuck or they didn't. Some will be there for life and some for a short time. Because we grow and change and grow some more. It's the same with your audience. You need to find your “ride or die” people, your I'd “definitely take a vacation with them” people, your “keeping you at an arms distance” people and all those in between. And people matter in your marketing, digital space and as your perfect clients. We know that if you don't know who you are talking to is hard to market to them. It's like throwing spaghetti at the wall and see if anything sticks. The key to getting the spaghetti to stick though is to make sure it's properly cooked. Same goes for your marketing. You need to know what goes into the pot and what the outcomes are before you can cook the perfect pasta. This is where both your persona and profile come into play. And it's important to remember that the two should work together in your marketing plan. But before we talk about how to create the right version of each, let's talk about what the job of each one is. Also, know as your target market, target audience or customer profile – the goal is to use it to pull people together into larger groups. Your audience profile is basically a summary of trends, historical data, and some research. There aren't about the behaviors and more about the demographics. For example, you identify your target market as 40 something small business owners in Pennsylvania who use laptops more than smartphones because they work from their home office rather than on the go. As you can see the profiles contain generic, basic information: geographic location, age, devices, browsers, etc. So rather than use the information to craft your content at the various buying stages, you use the data to see if your efforts are working in your marketing strategies. One piece that is often overlooked when crafting an audience profile is knowing what the audience wants. Are they looking for engaging content or actionable information? How about which type of content works best for them – written, visual or video? These questions can all be answered by watching your numbers. But before we talk about that let's define the persona. 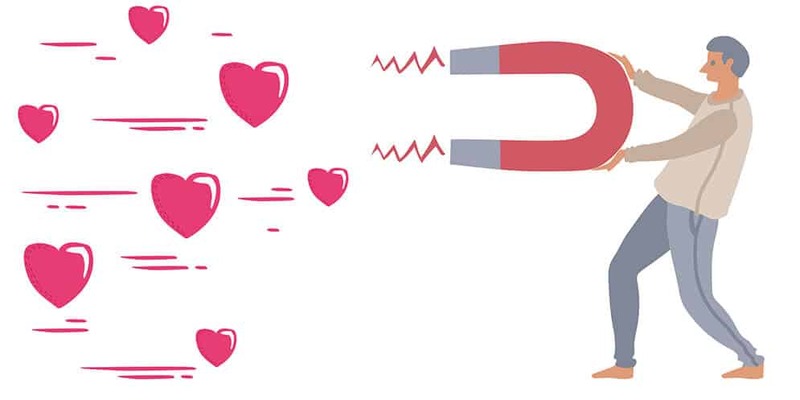 Your audience persona is also called by the name buyer persona, ideal client and target persons and is a much more zoomed-in overview of who you are trying to attract. They represent your users and it's not uncommon to have multiple personas. But you need to be careful that you don't create too many personas because that will make your marketing and content planning seem scattered and overwhelming. Your personas are manifestations of the person at the end of your sales funnel and shouldn't be created for every potential customer you want. A good practice is to keep them at three, based on the pain points you need to address. Dana DIYer, who has zero interest in paying big bucks for your solutions because she doesn't see the value in spending money on getting the help she needs. Dana is looking for information on how to achieve the results she wants. She wants her information in bite-size actionable chunks that she can implement herself while she builds her business and budget. The message voice for Dana would be informal and understanding. On the opposite end, you have Leslie Level-upper who already knows that to get ahead she needs quality targeted help. Leslie wants solutions and isn't affected by the minor details and action steps. She wants it done for her and isn't afraid to invest. She's busy creating magic and consumes content different than Dana. She wants a confident expert and connector. And somewhere in the middle, you have Debbie Done With You who is on the verge of being a breakout star. She's upwardly mobile and needs to start assembling her team of all-stars. Debbie wants to be in the know but is emerging from her DIY role. She needs a mix of content that will inspire, educate and instill confidence that you can address all her objections. As you can see from the above examples, each illustrates how you need to talk to the right people at the right phase of the journey. Each persona will help you determine which marketing campaign will work for each audience. So if you're addressing Debbie DWY with some how-to tips, you may want to create some videos so that she can visually get to know you are a person and not a business. Now that you know who is what and how they fit in, let's talk about some strategies for creating both. When creating your audience profile, you need to know who your reader is, how you can reach them, the best times to reach them and where they are coming from. The goal here is to turn data and insights into information. Consumers. These are the people who buy good for their own use and benefit. B2B. This group is made up of individuals and organizations who buy for direct use in creating other products or for use in their day-to-day operations. Resellers. The middlemen (or women) who buy or promote goods and resell them for a profit, sometimes known as affiliates. You can make this determination based on what you are offering. You need to determine your type because this is the base of your marketing message. If you are attracting resellers and affiliates, you'll need to create content and a website that allows them to pull and share with their people. You'll also need to make sure the checkout process is smooth and seamless. Where do they get their information? i.e., social media, direct search, friends, and colleagues. What type of content do they consume? Video, written, podcasts, IG stories are some places that will refer traffic to your site. What type of devices do they use? It's a given that your website needs to be responsive but are your people using smartphones over laptops or tablets to find their solutions. What browsers do they use regularly? Some Mac owners will only use Safari, while others will use Firefox and Chrome. It does make a difference because sites display differently on each individual browser. Knowing the behaviors of your audience will allow you to create the best experience for them by creating content that works for the devices they use. What is the age range of your most popular visitors? Where are they located and what language do they speak? Where are they in the purchasing process? What is the main action they should take? By understanding your audience and how they think and feel, you'll get closer to what drives them to make a purchase. Men research and buy differently than women because they are wired differently. And everyone is at a different place in the journey so you need to create for that too. This is the reason that you have an audience profile or target profile. You know the details but isn't it better to talk to a person and not a statistic. Your customers or clients are people too. So let's give them an identity. Putting names to faces humanizes them and it's easier to relate and predict how they will react and behave. Take the demographic information you've collected from the profile and give it a little more detail. What is their education and how do they like to learn? What income do they get from their business or job (or both)? What is their career path and how did they end up where they are today? Do they have a family, are single, caregivers or something else? The information you gather here gives you the foundation of your persona. All the details that are easy to find with a little research. But that's not enough because we need to know how they think and act. What role do they play in their lives? Are they a social giver, an adventurer, an introvert? What challenges do they face the will affect their decisions? What is their big hairy audacious goal or dream? We all have something that motivates us to move forward in this game of life. Not all paths are large and in charge, some may be as little as gaining an hour of time in their day to concentrate on well being. And these are the things that lead us to habits. What groups do they belong to or associations they are a part of? How do they gather new information to improve their daily lifestyle? How do they communicate with their peers, friends, and family? At the core, people have individual habits that together make up their day in the life stories. It's now time to craft a glimpse into what your persona's daily life looks like. Create a brief 200-300 word personal account of based on all the information you've gathered. This makes them like a friend you've known forever. It makes them more real because you've given them a backstory to build on. Mark is a savvy business owner who had a successful transition from corporate to entrepreneurship. He has done well with the licensed products he offers as solutions but needs to professionally present them and network to continue to build his client list. Mark has tons of leads but needs to engage with them and turn them into brand ambassadors. He knows to make that happen he needs to utilize technology but as an “old guy” doesn’t want to take on another role he isn't comfortable with. He is looking for a partner who can advise and make things happen. Mark needs to be able to work remotely since he is getting more and more speaking, keynote and presentation opportunities. He needs to be able to easily process orders, answer inquiries and consult with his team. He also wants his solutions to play nice with ActiveCampaign including the CRM so that he has everything updated when he's on the road. He reads national news and business publications as well as industry blogs and articles. 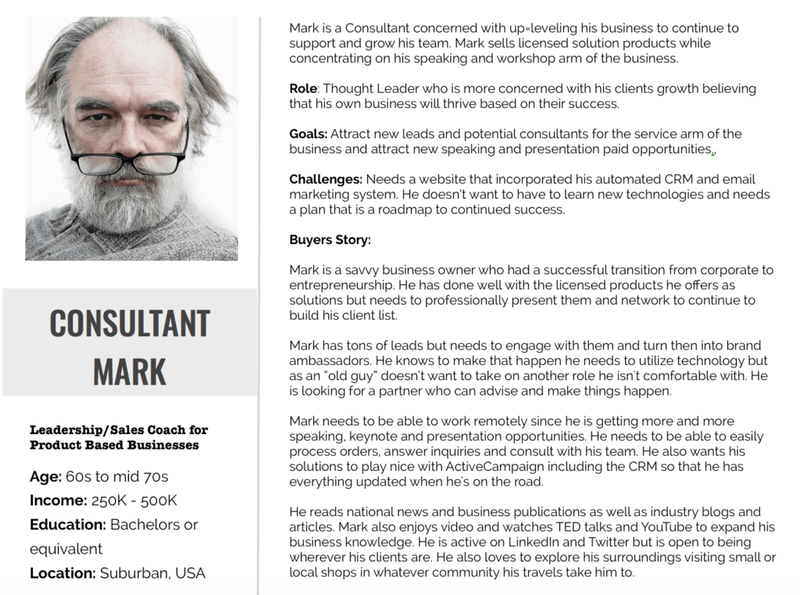 Mark also enjoys videos and watches TED talks and YouTube to expand his business knowledge. He is active on LinkedIn and Twitter but is open to being wherever his clients are. He also loves to explore his surroundings by visiting small or local shops in whatever community his travels take him to. Can you relate to Mark now? By drawing a big picture, you can clearly see where the gaps are in how his story intertwines with yours. And by having a profile, you can see if you're hitting the marks on the individuals you are trying to reach. There is a difference between your profile and persona with one working to enhance the other. Remember that neither is set in stone and will need to be tweaked and massaged as you grow. Sometimes talking through the process allows you to really dig deep. Schedule a free mini session today to get the party started and find the guests you want to join in.